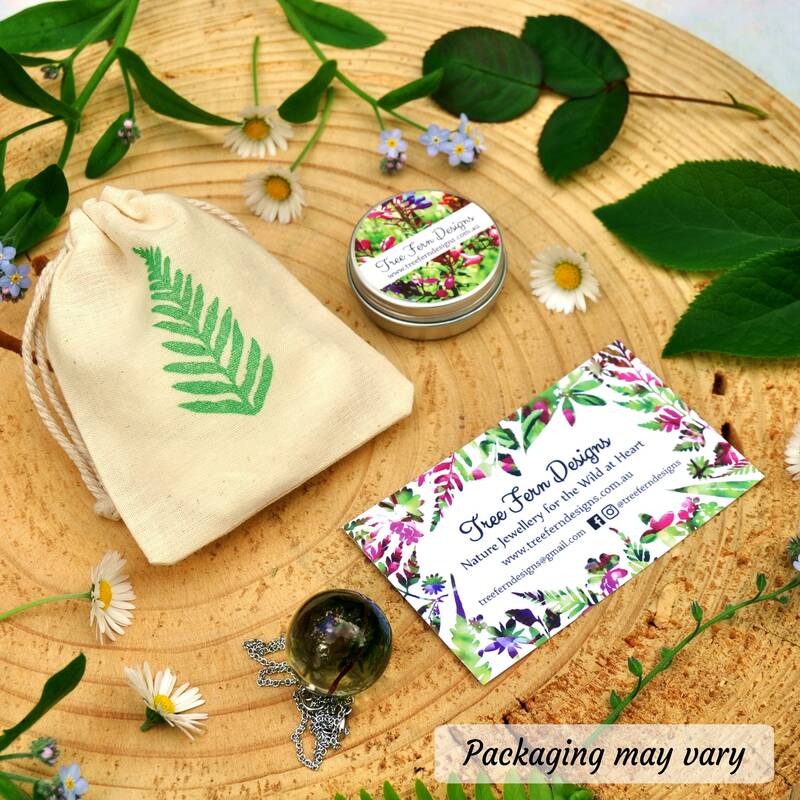 Welcome to Tree Fern Designs! Click here to subscribe to our newsletter, and get access to special offers & discounts. 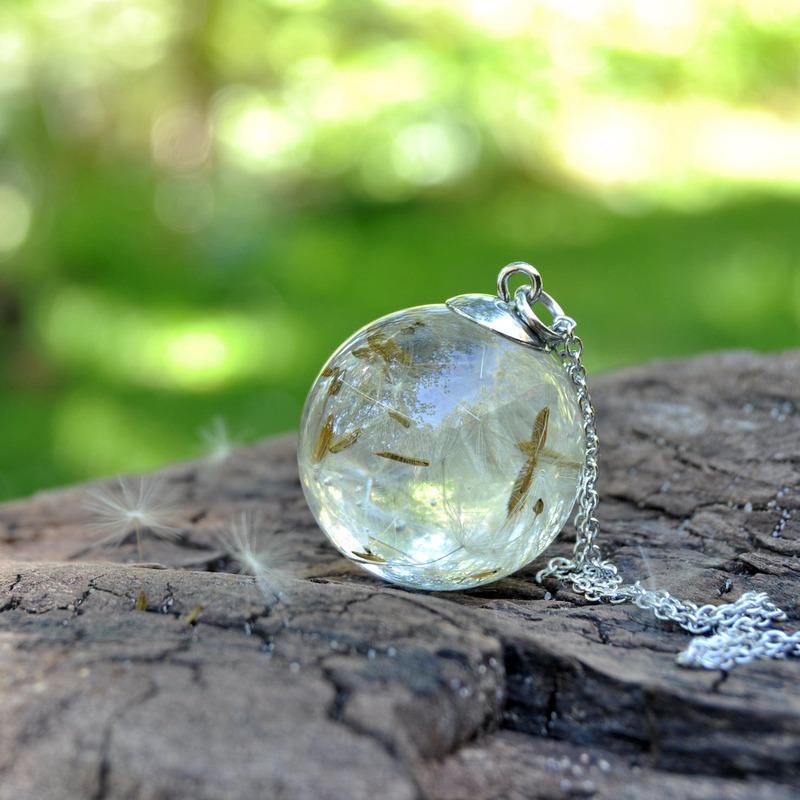 Dandelion sphere pendant necklace, made with real Dandelion seeds set in a glossy sphere of Eco Resin. 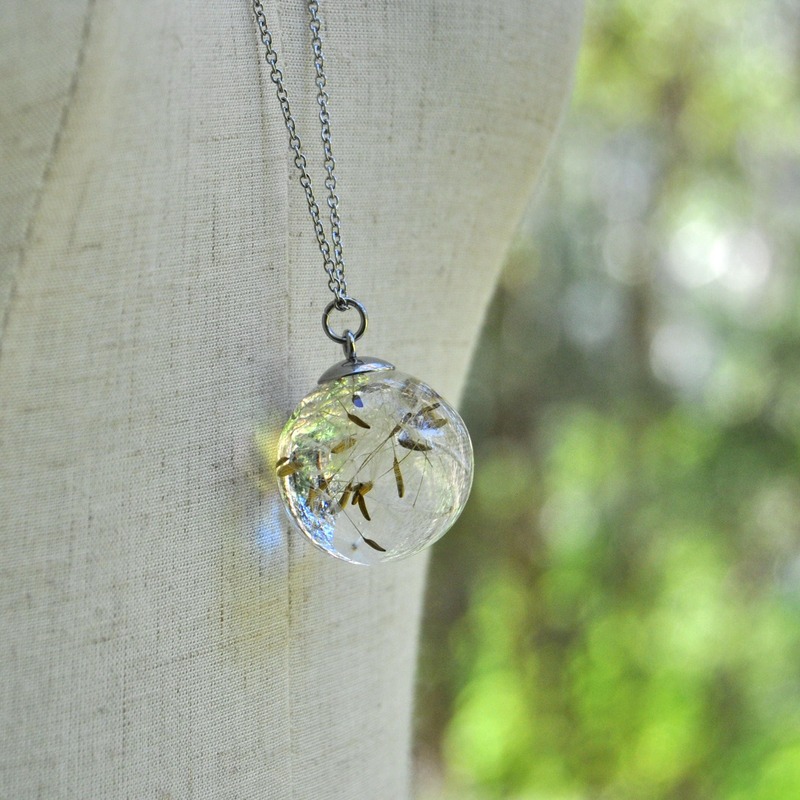 ♥ Plant: the seeds from the Dandelion, sometimes known as wishes or fairies. 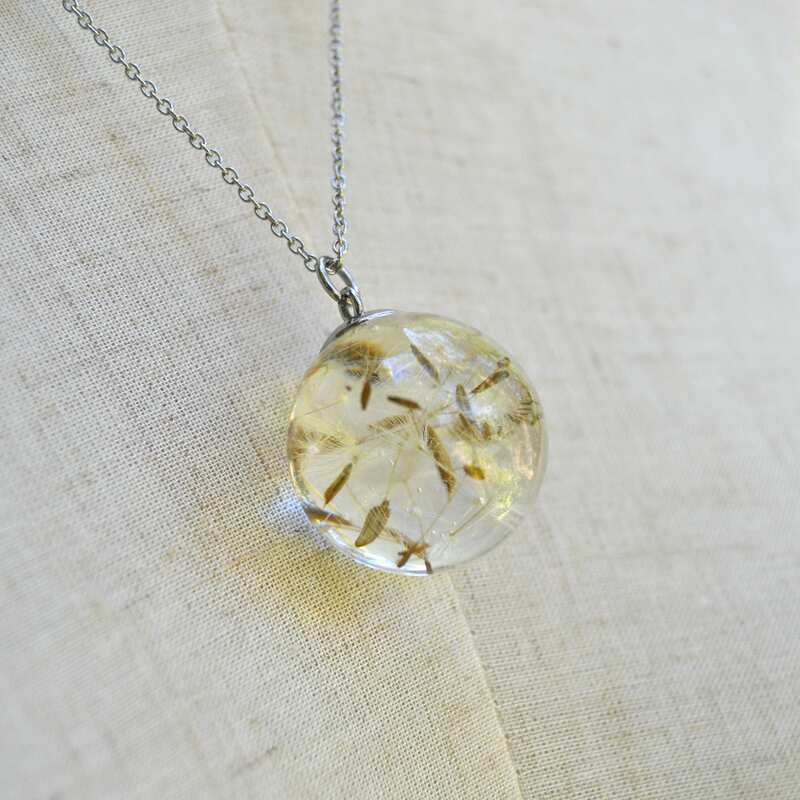 ♥ How it's made: The seeds are collected and dried, then set in a sphere of clear resin in a multi-layering process. The special layering technique I use is a time consuming process, however results in a higher-quality and long lasting piece, which fully protects the embedded botanical elements. 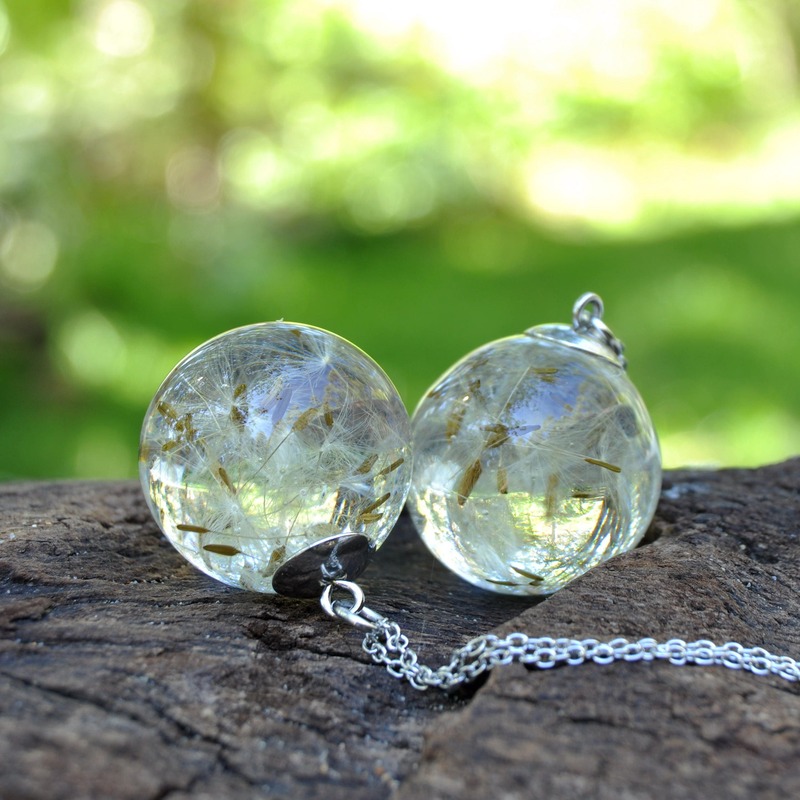 ♥ Size & Shape: The resin pendant is a glossy sphere shape, and measures about 18 mm in diameter. 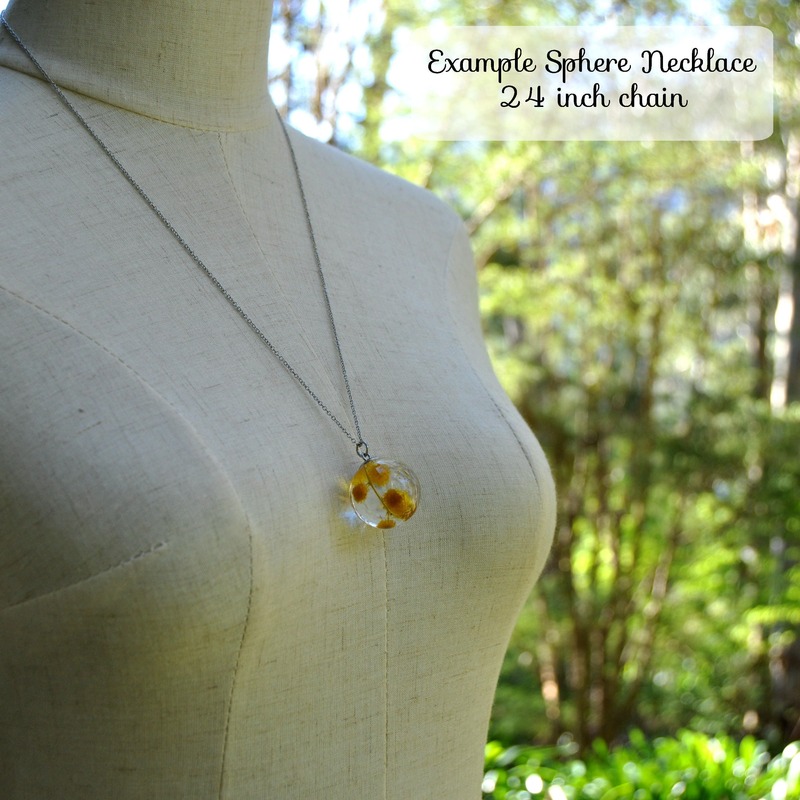 ♥ Stainless steel elements and matching chain - non-tarnishing & strong. 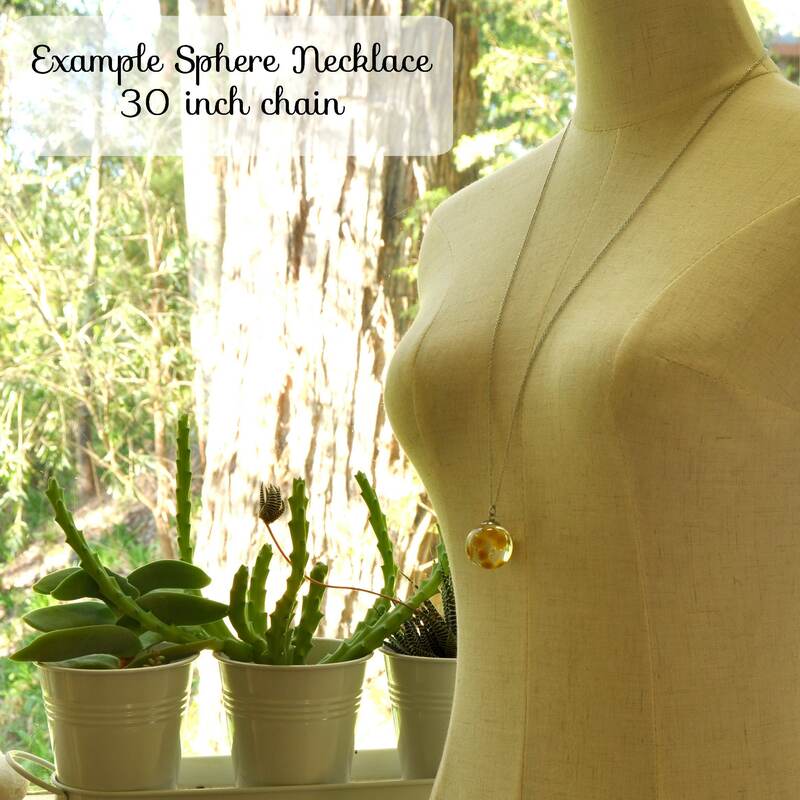 If you require a different chain length please leave me a note at checkout - I make all the chains to order. ♥ Gift messaging may be added to your order at checkout. Either ask for a blank note card (to write your own message), or leave a short message for the recipient and I will write it for you. ♥ Please read the "Shipping & Policies" section for further information on care, wrapping and shipping options. 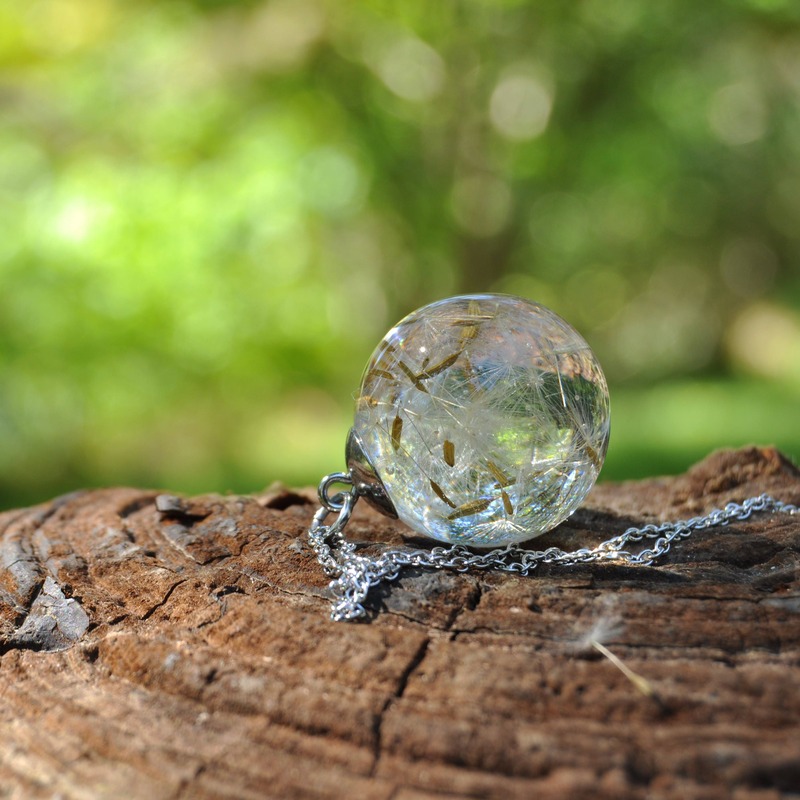 ♥ All Tree Fern Designs jewellery is handmade. Although I do my best to remove any flaws, there may still be minor bumps, bubbles or imperfections present. 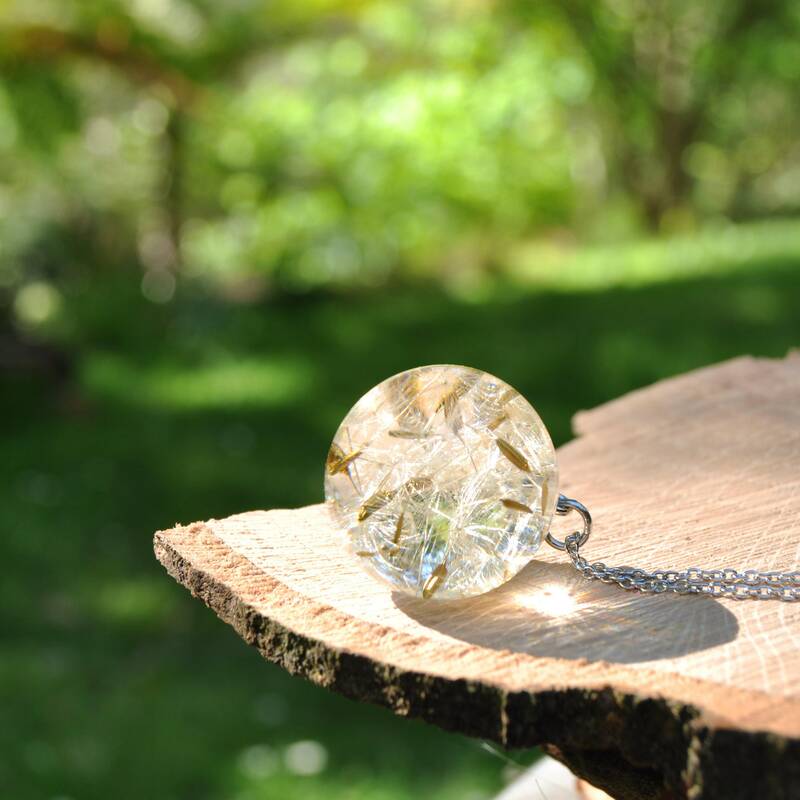 ♥ This item ships from Victoria, Australia - please consider shipping times if you are purchasing from overseas. "Free Shipping" items are usually shipped as untracked priority letters. (If you purchase multiple free shipping items I will usually upgrade your order to either registered post or tracking). "Standard Shipping" items are shipped with Australia Post as standard parcels - this includes full tracking. Express shipping (which also includes tracking) is available as an upgrade at checkout. Questions? Please ask before purchasing if you have any concerns. Most items shipped to the USA or Europe with 'Standard Shipping' take 3-4 weeks to arrive on average. This may vary depending on seasonal, customs or other delays. 'Free' or 'Standard Shipping' does NOT include full tracking - international tracking from Australia is considerably more expensive than the alternatives, so is it an optional extra, available at checkout. If you require tracking then please upgrade at checkout - this is also a faster postage method as a rule. Express international postage is also available. 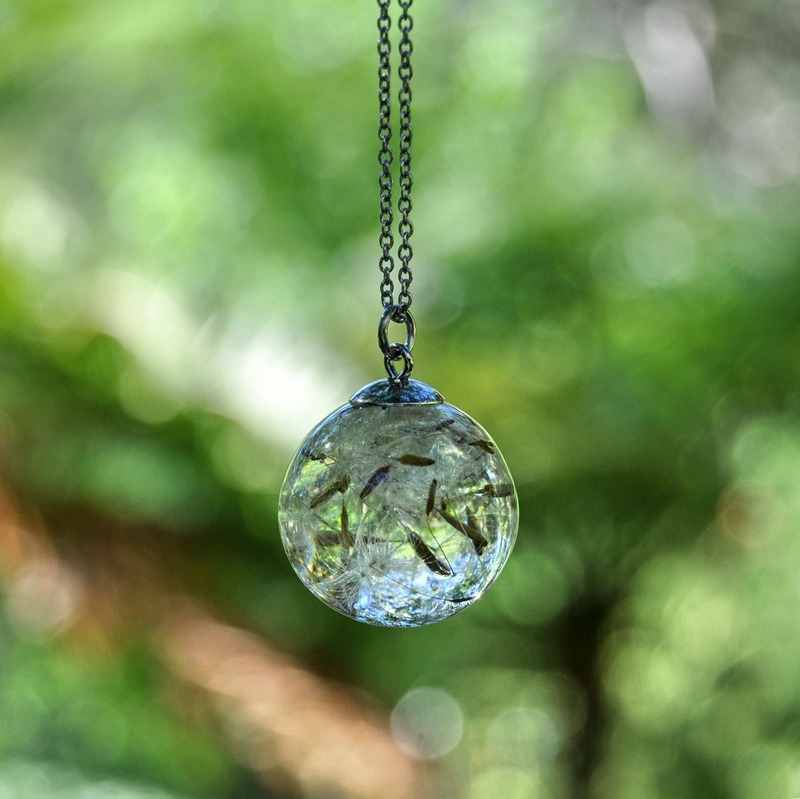 Eco resin jewellery has a durable and generally waterproof finish, however some special care is required to keep it at its best. •	Avoid scratching or dropping the resin and ideally store separately from other jewellery. I am currently using small cotton bags or small gift boxes as packaging/gift wrapping. If you order multiple items, they will usually be packed in one bag or box by default. If you are buying multiple items as gifts and would like separate packaging for each, please let me know which items need separate packaging at checkout. If you are sending your order to someone as a gift, and would like to include a note to the recipient, please leave a short message at checkout. I use small business-size note cards for this purpose and will handwrite the message for you.